The definition of ethereal is “extremely delicate and light in a way that seems too perfect for this world,” as fitting a definition for the small number of bison that remain in West as it is for the fog through which they now pass. Certainly, a bison itself is anything but ethereal ― each is about as light and delicate as a Mack Truck. Yellowstone’s winters are often severe with deep snows and temperatures that reach -44F. With thick skin and underfur, long hairs and layers of fat, these massive beasts are built to survive and thrive in such an environment. Even so the geyser basins, hot springs and thermals are attractive destinations during these frosty months. 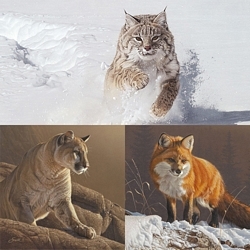 Daniel Smith’s "Ethereal Mist" shows why he is regarded as one of the greatest wildlife painters working today. This MasterWork™ Limited Edition Fine Art Canvas is a work of intricate design, impeccable artistic rendering and compelling narrative ― the hallmarks of a great work of art.